In a measurement of a material prepared between two parallel plate electrodes with spacing d, the complex permittivity, conductivity or impedance is evaluated from the phase sensitive measurement of the electrodes voltage difference US and current IS. This method presumes that the applied voltage US drops homogeneously within the material by creating a constant electric field E=US/d. bad electrode sample contact connections (contact impedance). Similar effects may be created by none zero impedance of the cables from the electrodes to the analyzer voltage and current terminals for low impedance samples. These effects can be in principle cancelled out if separate electrodes for the sample current and voltage measurement are used as shown below. Fig. 1: Principle set-up of a four electrode impedance measurement for electrode - sample interface and cable effects compensation. 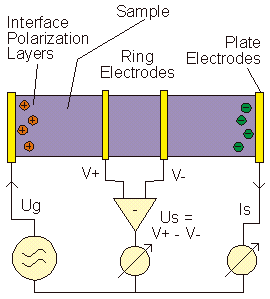 The outer two electrodes correspond to the parallel plates of a standard 2-electrode configuration. The voltage is measured by two additional (e.g. ring or needle) electrodes in the inner sample area where no interface effects exist and the field is homogenous. If the two voltages are measured by an instrument with infinite input impedance, no current flows in the voltage electrodes and therefore no ions can accumulate. Due to the zero current, existing contact or cable impedance do not create a voltage drop, too. In this case, the electrical parameters of the material portion between the voltage electrodes can be evaluated without interface polarization and contact or cable effects from the voltage difference between the voltage electrodes and the current flowing through the outer electrodes. The only, but in practice crucial and not always fulfilled presumption is the sufficient high input impedance of the voltage channels. The ZG4 and POT/GAL Test Interfaces of the Alpha-A analzer series and the Beta analyzer series can in addition to 2-wire- be configured for 3-, or 4-wire measurements. Their input impedance is higher as 1012 Ω in parallel with 10 pF which exceeds the range of most competing instruments by several orders of magnitude and therefore can be seen as a major improvement in broadband 3- and 4-electrode dielectric, conductivity and electrochemical impedance measurements. On the other hand, especially for high impedance samples at high frequencies the 10 pF input capacity may be in the same order of magnitude as the sample capacity and may contribute to the measured result. 3- and 4-four electrode measurements therefore in practice always require a detailed analysis of the currents flowing into the voltage terminals and the related voltage drop at contacts or electrode interfaces.